One hot July afternoon, three years after the death of Morse, a tall young professor of elocution was toiling grimily and busily in a workshop in one of the back streets of Boston, U.S.A. He bent over a crude and makeshift arrangement, which seemed to consist mainly of a clock-spring, magnet, and electric-bell wire. In the next room a friend sat at a desk, bent over another similar apparatus. The tall man bent his ear over his odd mechanism, obviously straining every nerve. Suddenly there came a faint twang, a clear, unmistakable musical note. It was the first sound ever transmitted by telephone, for the man in the next room had just snapped a spring into his own instrument, and the noise reproduced itself exactly in the ear of Alexander Graham Bell. Bell sprang from a family of elocutionists. His brothers, his father, and his grandfather, had taught the art of correct speaking in the universities of London, Dublin, and Edinburgh. The grandfather had specialized in the cure of stammering. The father, author of a dozen and mere standard text-books, had changed elocution from an art to a science, had begun the study of rational phonetics, and had laid the foundations of lip-reading, by which the world of busy human activity is opened to deaf-mutes. The grandson, Alexander Graham Bell, was born in Edinburgh on the 3rd March, 1847. He was educated in his native city and in London, and he acquired a fair knowledge of such diverse subjects as anatomy, music, electricity, and telegraphy. His schooldays over, he spent a few years teaching elocution (for which he had an hereditary gift) in various schools in and around London. During this period he made the acquaintance of Alexander Ellis and Sir Charles Wheatstone, both of whom unconsciously directed him towards his real career as a pioneer of applied science. Ellis introduced him to the researches which the famous physicist, Helmholtz, had made into the physical basis of music. Bell conceived the notion that the results of these experiments might be adapted to the purposes of a "musical telegraph"—a telegraph able to send many messages over a single wire by the use of a variety of musical notes. This notion gradually took form in his brain, and, as we shall see, proved the starting-point of the invention of the telephone. Full of this "musical telegraph" idea, Bell approached Sir Charles Wheatstone, the famous scientist, then in his sixty-seventh year, and the first British authority on matters of telegraphy. Wheatstone showed the utmost kindness to this twenty-two-year-old Scottish elocutionist, for he perceived in him the magic fire of genius. He discussed the whole matter with Bell, showed him what other inventors had already accomplished, and, by his whole-hearted enthusiasm, convinced Bell that science was the only possible career for him. Suddenly, however, in the midst of all his high hopes, Bell was struck down by incipient consumption—a disease which had already caused the death of his two elder brothers. Medical men decided that nothing except a complete change of climate could save his life. With a rare self-sacrifice, Bell’s father abandoned his own career, and, together with his wife and his last remaining son, he migrated to Canada, finding a home in the then tiny township of Brantford. There for more than a year Bell fought against his terrible illness, never despairing or giving in for a moment, while, to occupy his time, he taught his father’s carefully evolved system of "visible speech" to the local settlement of Mohawk Indians. In April, 1871, vastly improved in health, Bell obtained a post with the Boston Board of Education. His task was to instruct a class of deaf-mutes in his father’s system of " visible speech," a work for which he had the greatest enthusiasm, as he had already met with some success in similar work in London. During the next two years he abandoned all thoughts of the "musical telegraph," and threw himself heart and soul into his new sphere of work. He was so successful that his class became an educational sensation, and won for him a professorship at Boston University. Scarcely had he entered upon his professional duties, however, than two of his pupils suddenly brought him back to his projects in electricity. One of these was a five-year-old deaf-mute, named George Sanders, whose grandmother engaged Bell to teach the little boy to speak. The Sanders family lived at Salem, sixteen miles from Boston, so Bell went to live with them, travelling daily to Boston to discharge his duties. In the Sanders family he found truly sympathetic friends, who allowed him the use of a cellar in which to fit up a workshop. Within a month he had filled his underground lair with batteries, coils, cells, and tuning-forks. Secretly he worked away far into the night, oblivious of sleep, only conscious that he was on the brink of "something." His other stimulating pupil was a girl named Mabel Hubbard, who had lost her hearing, and subsequently her speech, owing to a severe attack of scarlet fever during infancy. She was fifteen years old when Bell met her, and she seemed to him the incarnation of all he most lacked in the world. Impulsive and headlong in all things, he fell in love with her, and four years later they were married. She proved a wife in a million. She encouraged and sustained him unceasingly, stood between him and the practical everyday world, writing his letters and copying his patents. While living with the Sanderses, Bell met Dr. Clarence Blake, a Boston ear specialist. To him the impulsive inventor poured out all the difficulties of the moment!. He was then intrigued by the idea that the deaf might be taught to speak by sight. Dr. Blake suggested that Bell should use a real human ear for his experiments. Accordingly he sent him a complete ear from the dissecting rooms, and Bell spent his evenings in the cellar at the task of speaking into a dead man’s ear, in order to see how exactly the sounds were transmitted through the wonderful and delicate human aural mechanism. From his experiments he concluded that some sort of a telephone, built on the principles of the human ear, might be possible. Immediately, he turned from the teaching of deaf-mutes to his electrical experiments once more. He then abandoned his professorship and instructed only George Sanders and Mabel Hubbard, snatching every moment he could for his new experiments. This, however, did not please Mr. Sanders or Mr. Hubbard, both of whom had financed Bell in his "musical telegraph" idea. "You must abandon your foolish telephone," they said, but Bell did not heed their exhortation. At this juncture, when on a visit to Washington, Bell met Professor Joseph Henry, then by far the most learned authority on electricity in America. A veteran of seventy-eight, Henry saw in Bell what Wheatstone had perceived, and he started to work on an experimental telephone apparatus, which Bell had brought with him from Boston, just as he had worked at the first telegraph instruments before Bell was born. Bell returned to Boston vastly encouraged by Henry, and he moved his workshop thither from Salem. Bound by an agreement with Sanders and Hubbard, he was forced to devote himself chiefly to the "musical telegraph." Yet both he and his assistant, Thomas Watson, believed secretly in the telephone, for had not Henry said, "You are in possession of the germ of a great invention"? So the two men often left the "musical telegraph," and toiled feverishly during stolen hours with their embryo telephone, until some three months after his momentous visit to Washington the first faint twang, transmitted by Watson, reached Bell’s ears in the next room. Having succeeded thus far, Bell resolved to concentrate his attention solely upon his telephone. He won over Sanders and Hubbard, while Watson was already an enthusiast, ready to face poverty, starvation, anything, if only the telephone could be perfected. For nearly a year Bell and the devoted Watson laboured on. They tried all sorts of diaphragms, all strengths of currents, all manner of circuits. Still their telephone would do nothing more than gasp, grunt, and sigh. Then, quite unexpectedly, on the 10th March, 1876, it talked. Bell set to work to draft a patent specification. On his twenty-ninth birthday, he received the patent warrant, No. 174,465, which proved to be "the most valuable single patent ever issued in any country." A new faculty had been given by invention to the human voice. Exactly two months after the first words had been transmitted by telephone the Centennial Exposition at Philadelphia was opened. Moreover, Mr. Hubbard, Mabel Hubbard’s father and Bell’s financial backer, happened to be one of the chief authorities there. Naturally, great advantage was taken of such a piece of good fortune, and in the department devoted to education a small table was installed, on which rested the first telephones. One day, as Bell stood by his telephone exhibit, the last Emperor of’ Brazil, Pedro II, entered the room, attended by a brilliant suite. He walked straight up to Bell~~ whose acquaintance he had already made in connexion with his deaf mute classes at Boston. The pair entered into conversation, and Bell showed his new invention to the emperor. A wire had been strung from one end of the room to the other, and after a few minutes Dom Pedro went to the receiver end, while Bell himself spoke through the transmitter. The emperor placed the receiver to his ear, listened, started, dropped the receiver, and exclaimed in utter amazement, "It talks." Among those who accompanied Dom Pedrol were Henry, and Lord Kelvin, then William Thomson. Each in his turn made various tests of the apparatus, and the two famous scientists spoke to each other, as delighted with Bell’s invention as two children with a fine new toy. Finally, Lord Kelvin passed judgment. "It does speak," he said, "and it is the most wonderful thing I have seen in all America." As a judge, Lord Kelvin subsequently presented Bell with the highest possible award, describing his telephone as "the greatest marvel hitherto achieved by the electric telegraph." From a scientific point of view Bell’s telephone now needed no other recommendation whatever, but what of its financial and practical prospects? At first, business men were unanimous in voting it nothing more than a scientific toy— a toy which could never become of practical value. The whole thing was voted absurd, and poor Bell had to submit to such epithets as "crank," "impostor," "impudent ventriloquist." Nevertheless, Hubbard now took it upon himself to become the champion of the telephone. He was a man widely known and universally respected as a supporter of all sorts of public improvements, and was thus the very person to bring such an invention before the public eye. He preached the telephone day and night, week in, week out. He borrowed a telegraph line from New York to Boston, and Bell, with Watson’s aid, sent an audible message over it. Wherever he went, he carried a telephone outfit in a suit-case and gave demonstrations to all and sundry. Nothing seemed too small or too great for his apostolic ardour to attempt. Finally, in October, 1876, Bell and Watson arranged and carried out a three hours conversation by telephone between Boston and Cambridge Observatory, in the presence of prejudiced and hostile witnesses. This finally broke down the obstinacy of the "practical man," and the telephone began to be taken seriously. Newspapers took a keen interest in Bell and his invention, and he was inundated by requests for lectures and demonstrations. A month or so later six Boston banks, which were connected by a common burglar-alarm circuit, had telephones attached to the ends of the wires. Hubbard lent the necessary instruments free, and, needless to say, managed to see that they were used. The popularity of the new invention soon spread. Obviously it was incredibly useful and handy, and by the time Bell’s patent was sixteen months old there were no less than 778 telephones in use. Although the telephone had overcome many difficulties, the battles already fought were but skirmishes compared with those to follow. Before the end of 1878 a perfect mob of rivals and pretenders were in the field. A host of men suddenly presented claims that they were the real and original inventors of the telephone. The most plausible, persistent, and formidable of these was Elisha Gray. A professional inventor, Gray had been busy on the "musical telegraph" notion for many years, and had conceived the idea that some sort of a telephone might possibly be invented. Oddly enough, a few hours later, on the very day on which Bell filed his application for a completed patent, Gray filed a caveat on the same subject. Now a caveat merely implied that the filer of it believed that he might be able to invent a certain device, but explicitly declares that he has not yet done so. Thus it was absurd for Gray to pretend that he was in the field before Bell. Nevertheless, he took his claims to court, only to meet with disappointment. This would have been enough for most men, but Gray was nothing if not persistent, and for a dozen years he continued to put forward all manner of claims against the Bell patent. In some quarters he is still considered a hardly used, almost a cheated, man. But examination of the evidence and judgments in his numerous suits will completely prove the truth of one lawyer’s opinion: "Of all the men who didn’t invent the telephone, Gray was the nearest." A far more serious adversary, however, than any inventor with a grievance was the Western Union Telegraph Company. At that time the Western Union was far and away the largest and richest telegraph company in the world. Its directors saw in Bell’s company a potential source of danger to its own monopoly, and at once set to work to overcome it. Three inventors, Edison, Gray, and Dolbear, were employed to invent a telephone which should be as good as Alexander Bell’s, and yet not infringe his patent. The Western Union’s chief electrical expert attempted to find an invention which preceded Bell’s. He even employed a linguist, who knew eight languages, for purposes of translation. All to no purpose, however, for, as the final report to his directors states, "I am entirely unable to discover any apparatus... anticipating the invention . . . and I conclude that his patent is valid. . . ."
Then the Western Union tried to squeeze out the Bell Company by means of influence and its own long purse. For a time things looked as black as possible for Bell and his partners. They were neither rich, influential, nor powerful enough to fight such a vast concern as the Western Union. Each day people expected to see the Bell headquarters hoist the white flag of surrender. Finally the Western Union espoused Gray’s claims to be the real inventor of the telephone, and instructed its lawyers to proceed against Bell for infringement of Gray’s patent. The resulting lawsuit began during the autumn of 1878, and was waged from court to court throughout twelve months. After this prolonged struggle the Western Union’s chief counsel, George Gifford, came to the conclusion that a decision could never be obtained in favour of Gray, and the proceedings were therefore dropped. Soon afterwards the litigants came to an agreement, almost wholly in favour of the Bell Company. Thus the tiny company defeated the huge power of the Union and made its own terms, and as a result its stocks rose by leaps and bounds on the Exchange. This, however, was by no means the last battle fought by the Bell Company. In all, the company fought no less than 600 lawsuits, and only in the case of two minor matters of contracts did it fail to gain the verdict. 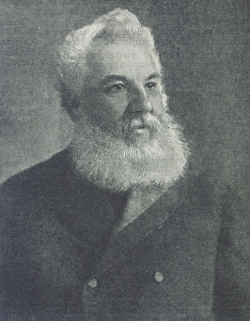 During 1882 Bell, true to his character, went out of the telephone business. He transferred all his stock to his wife, and resumed his task of teaching deaf-mutes to speak. He felt he had played his part by his invention. The endless lawsuits and wrangles in which his company had become involved affected his highly strung nervous temperament beyond endurance. In vain did the Bell Company offer him a vast retaining fee to continue as its chief inventor. Bell cheerfully answered that he was not the man to invent to order, and went back to the instruction of his deaf-mutes. During a further thirty active years Bell championed many more causes, engaged his ardent intellect and character in a multitude of interests, and received many honours and decorations. To the end of his life he remained one of the most picturesque and intriguing personalities in American public life. No citizen of the great republic has been held in more universal respect than he. He was, above all else, genuine, transparently honest, and candid, and also one of the most charming creatures in the world. He died in 1922, mourned by a host of friends and admirers. Though his achievements and glories were many, none can compare with the result of those exciting night hours spent experimenting in the Sanders’ cellar at Salem.